Gardens can be more than artful displays of plants: they can also include arts and crafts that reflect the owner’s tastes, interests and creativity. Collectively, such items comprise the garden’s décor. The selections that we might encounter in gardens range from stunning works of fine art to found art to “junktique,” with items such as plants growing in worn-out boots. This range could be defined in terms of cost. For many home gardens, the most prominent décor consists of plant containers, which offer many opportunities for artistic expression. The more successful of these expressions present an interesting relationship between the container and the plant(s) it contains. The less successful involve uses of nursery cans, which are typically black plastic. Such containers could be seen as an exercise in utilitarianism: they are valued for their usefulness and low cost. Gardeners often acquire their décor often on the open market, but they gain the most satisfaction by making their own pieces. This requires creativity but doesn’t necessarily require artistic skill. 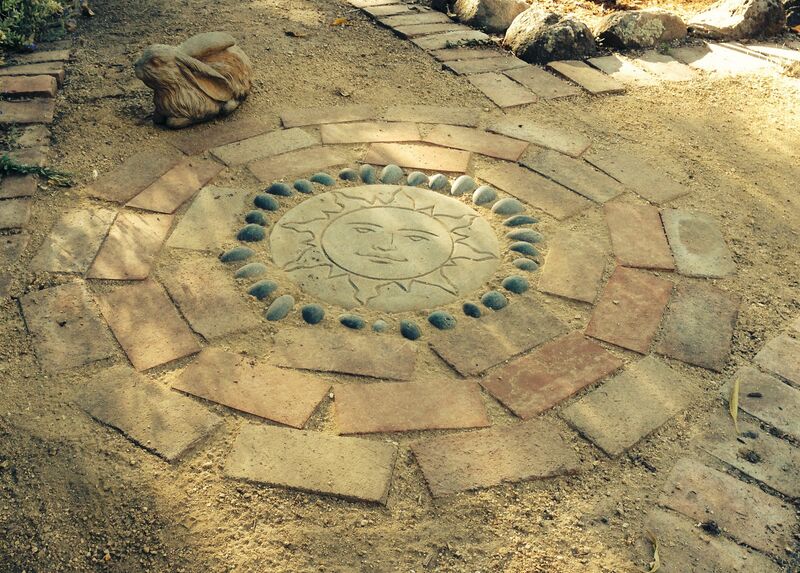 As an example, this “garden path medallion,” one of four in my garden, is a unique product that required care to build, but inexpensive materials and only a modicum of artistry. The medallion is four feet in diameter. My rabbit, Harvey, is sitting in to indicate the scale. An important component of this project is a circular strip that retains the circle of bricks. I found this product on Amazon.com, marketed as the “EasyFlex No-Dig Tree Ring Kit.” This strip retains the bricks with a 1.5-inch high edge, low enough to hide under the pathway surface. I purchased common bricks for the four medallions, each of which required 34 bricks. We installed the steppingstone and bricks in a bed of decomposed granite (also called path fines), which has angular grains that lock into a firm yet permeable surface. Beach sand has more rounded grains that stay too loose for such applications. Common bricks are too large to form a tight ring around the steppingstone, so we used black, oval-shaped stones, sold as Mexican pebbles, three-to-five inches long. We installed them on edge, and used a rubber mallet to level them with the steppingstone and bricks. The last step was to sweep decomposed granite into the gaps and water it to settle it around the hard materials. The costs for each medallion include the tree ring $10; 34 common bricks: $34; Mexican pebbles $16; cast concrete steppingstone $20, more or less, for a total of about $80 for a near-permanent feature. Decomposed granite costs $40-to-$50 per cubic yard, but the amount required for this project would depend on the length, width and depth of the pathway. A relatively new product for filling the gaps between stones is polymeric joint sand, which includes a water-activated polymer that forms impermeable joints. This product, available from masonry services, costs $15-to-$20 for a 60-pound bag. For pictures of many do-it-yourself garden arts and crafts projects, visit Pinterest.com and search for “steppingstones,” “garden crafts,” “garden arts” or related topics of personal interest. You might be inspired to adapt someone else’s idea or come up with your own unique creation. However you proceed, décor could bring interest to your garden and provide creative opportunities fvor the gardener. If you enjoy tulips, this page provides a fascinating and informative display of the origins of many different tulips. If you thought that tulips come from the Netherlands, the truth is that only hybrid tulips come from growers in Holland. This webpage shows the real origins of this popular garden plant and could suggest a new idea for plant collecting. This entry was posted in Essays 2014, Fall Quarter and tagged Decorations, Design, Pathways by tomkarwin. Bookmark the permalink.